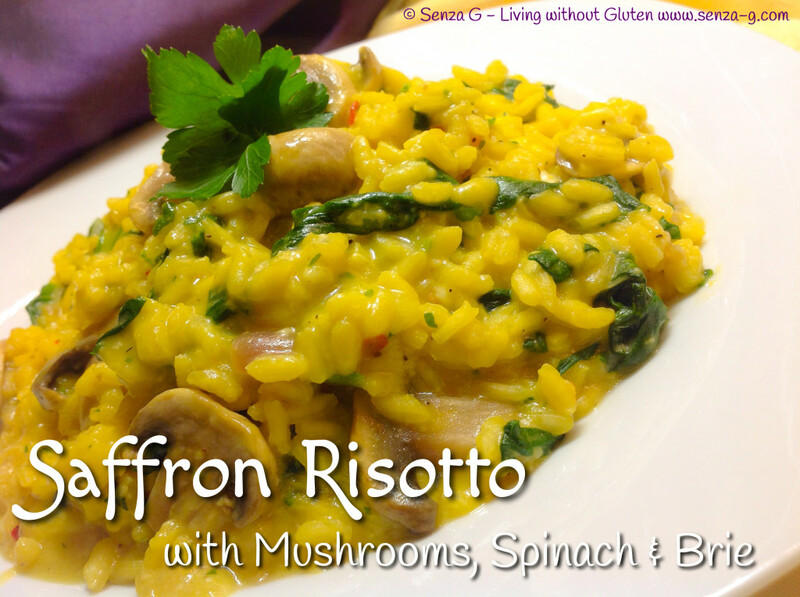 Based on the Risotto Milanese but with a few extra ingredients, mushrooms, spinach and brie cheese. Such a combination of beautiful flavors! Sauté the onion in a little olive until translucent. Add the rice, stirring until it is covered with the oil. Add the wine which will be absorbed almost immediately. Stir in the minced garlic and add a ladle of stock. As soon as the stock looks almost absorbed, add another ladle. Add the saffron powder, stirring it in the rice. Add the sliced mushrooms and stir in. Continue adding a ladle at a time till the rice is nearly al dente. Do not let the rice dry out. It should still have a little stock. Add the spinach leaves, combine with the rice till they wilt. Add the parmesan cheese, the chopped brie and a knob of butter. Stir well until the brie and butter melt and they are fully combined. Season, cover and leave for a few minutes before serving.